“Routines are altered”. It may be fun for the normal kid who gets to avoid school work and celebrate with another party, but it is difficult for a child with autism to adjust quickly and be happy with the change in routine. Don’t force a child with autism to play games and socialize. Possibly allow them to play on a game system to bring joy to their world while the other kids engage in Christmas parties. Make it fun for them, but do not expect them to have fun in the same way other kids are. “Family Gatherings”. The season of Christmas brings families together and with this comes much visiting and traveling and my favorite, food. For a child with autism, who has difficulty socializing, this may be a terrifying time in their lives. Please be cautious of this because they will not turn into a “social butterfly” because a Christmas bug bit them. Prepare your family/ friends in advance and allow them to have “alone” time even when the family gathers. They cannot process too many conversations going on at once and this can surely cause a meltdown or shutdown. Now back to us as caretakers. Christ saw something deep inside of us and said, “I have a special gift to give you.” And so, we were given a child with autism. When Jesus was born in a manager, Mary and Joseph had no idea the impact He would make in this world. He was just a sweet precious baby. When we held our child in our arms, at the time, we never knew the diagnosis of “autism” would later shatter our worlds. 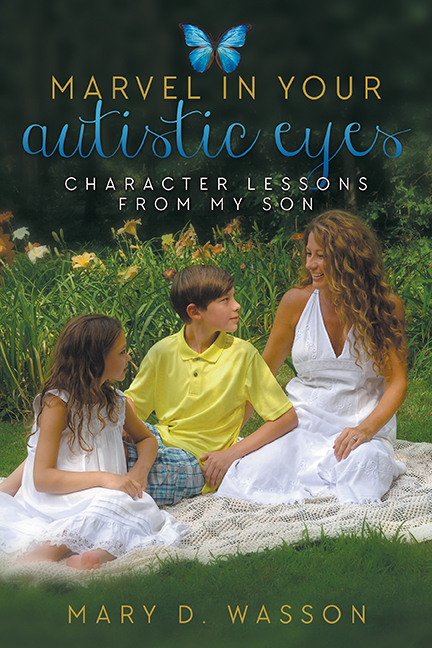 In time, though, if you will allow it, you and I will come to realize, “we were given the most special gift” because our child with autism is making an impact on our world in ways we could only dream of….as found in the pages of Marvel in Your Autistic Eyes, Character Lessons from My Son. Won’t you celebrate this Christmas the gift, your child with autism, designed exclusively for you? I just so happened to stumble accross your video today, about the Christmas bulb. I loved it, and I instantly took a liking to you. You are a great motivational speaker. Autism has struck both my grandchildren, my grandaughter who is 8, and my grandson who is 3 and lives with me, I am his guardian. He is the light of my life. To listen to you, makes me snicker and reminds me of some of the silly stories I have of my little guy. God Bless You and Your family. I would love to keep hearing more from you. Mary, this is Jeff…I am so proud of you and the message you are leaving with others! You were always an inspiration to those around you, and it is NO SURPRISE that you continue to be, SHINE ON!